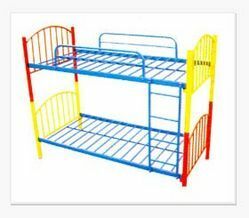 We manufacture our range of Colorful Bunk Bed products using supreme quality materials and hi-tech machines. Post production, these products are tested on various parameters by our strict quality controllers. Bunk Bed in Powder Coated pipes. Ready to assemble design. Sleek , Sturdy and attractive design. Made from 18 gauge CRC pipes of different specs. Suitable for two kids and Adults. We provide two nos. of 12mm commercial ply of 72" x 35" with this bed. 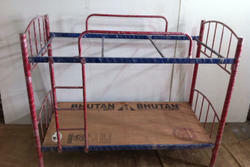 Multi Colored Bunk Bed for Kids room / dormitories. Ready to assemble. Made from high quality steel, this sturdy and comfortable bed is specially designed to save floor space in a stylish way. Specifications: Attractive and very sturdy Bunk-Bed in 2" Dia. round 18 gauge CRCA Pipes in outer frame Multi-colored powder coated frame with ply size 72"x 35". Looking for Colorful Bunk Bed ?